A ghoul's got to eat! When dining in the Creepateria, the un-natural place to feed a monster appetite, Cleo de Nile doll also dresses to see and be seen in fangtastic fashions. Her clawesome new outfit and monsterrific accessories show this ghoul knows how to do lunch. Plus, her bowl of grapes and goblet - that fit on her golden coffin-shaped lunch tray - make any Daughter of the Mummy drool. Her colorful one-shoulder look has a scary cute sheer ruffle sleeve, scary cool straps and a Nile blue belt. Killer accessories include a pink necklace, blue triangle bangle, regal headpiece and Egyptian-inspired golden shoes. The next looming question: where to sit… Collect her GFFs (each sold separately) for lunch company! Includes Cleo de Nile doll wearing fashion and accessories, lunch tray, food and drink. Doll cannot stand alone. Ages 6 and older. 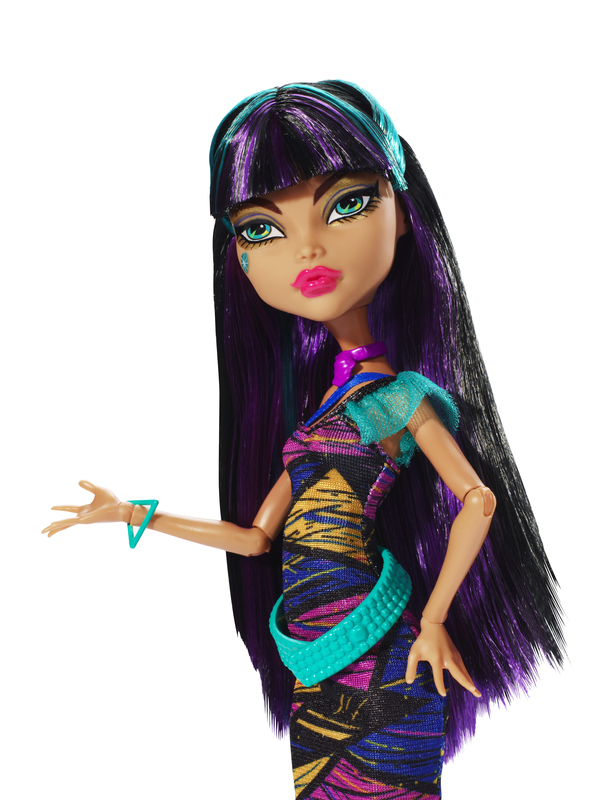 A fashionably fierce ghoul, Cleo de Nile doll dresses to see and be seen in the Creepateria. She’s ready to do lunch in a colorful one-shoulder look has a scary cute sheer ruffle sleeve, scary cool straps and a Nile blue belt. Her bowl of grapes and goblet fit on her golden coffin-shaped lunch tray. Killer accessories include a pink necklace, blue triangle bangle, regal headpiece and Egyptian-inspired golden shoes.